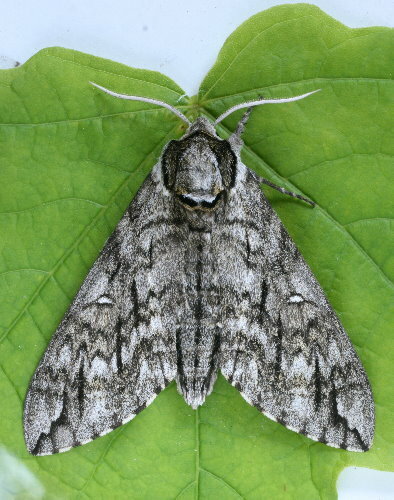 Here on my own blog, I haven’t posted anything on moths for a little while, there’s just been so much else to write about! So here’s a brief mothing interlude. I’m up well over 200 species identified for the year so far, and there’s no way I could include everything I’ve been seeing. So I thought I would just mention one group of moths that, because of their size and unusual shape, are one of the more eye-catching families of moths. 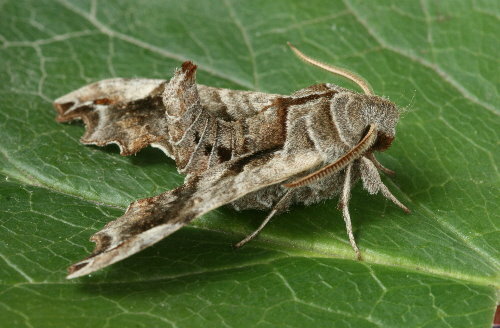 The family is Sphingidae, the Sphinx moths, which includes some 124 species in North America. The most familiar to most people are probably the day-flying hawkmoths, which are often seen hovering at flowers in gardens or meadows. Other people may know the group by their caterpillars, sometimes called hornworms for the long “spike” that protrudes from the tail-end, such as the Tomato Hornworm aka Five-spotted Hawkmoth. However, these two subsets make up only a tiny portion of the sphinx moths. All of the moths in this post are ones that have come to my lights at night so far this spring. With the addition of the Nessus Sphinx that I spotted briefly visiting the dog poop on the driveway, I’m up to 13 species of sphinx. There’s an incredible range of colours, shapes and sizes even within this small bunch of species. The Lettered Sphinx is one of the smallest, at approximately 1.5 inches (4cm) long, and of the ones shown here, the Modest Sphinx is the largest, at nearly the size of my palm. The Small-eyed Sphinx is the most colourful, with rich yellows, periwinkle blues and deep maroons. 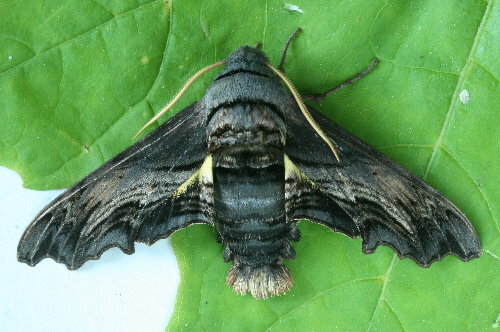 Some of the most unicolored are in the nominate genus Sphinx. 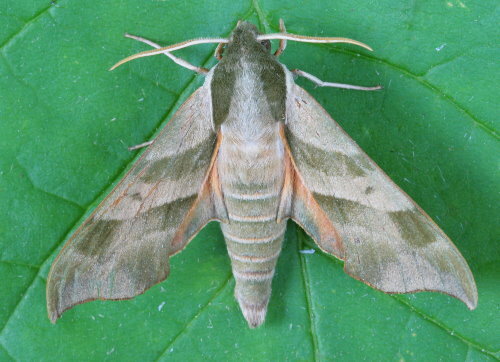 There are some that curl their abdomens up, holding their wings above the surface they’re resting on in a very distinct posture: Lettered Sphinx, for instance, or Walnut Sphinx. 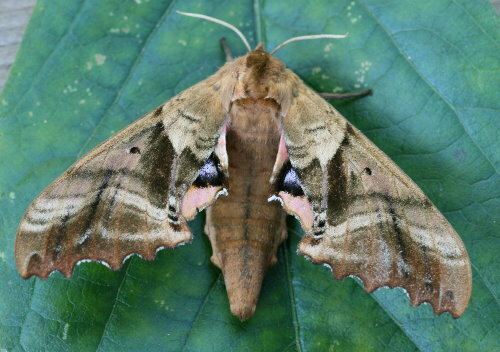 Abbott’s Sphinx curves its back and curls its wings downwards when at rest; the parallel lines along the trailing edge of the forewing create the fairly convincing impression of broken bark. 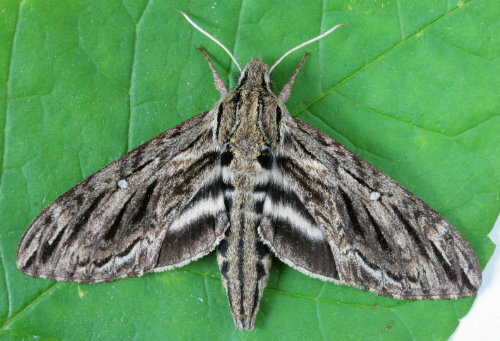 The sphinx moths are one of the most well-studied groups of moths, simply because their large size, often bright colours and eye-catching shapes and habits make them more interesting than most other groups of moths. 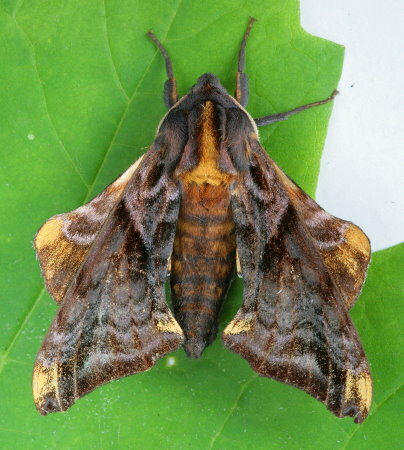 Sphinx moths, like silkworm moths, are sometimes raised from caterpillars in captivity, providing information on their life cycle. Of course, most of that rearing was for the purpose of then killing and mounting the specimens for private collections. 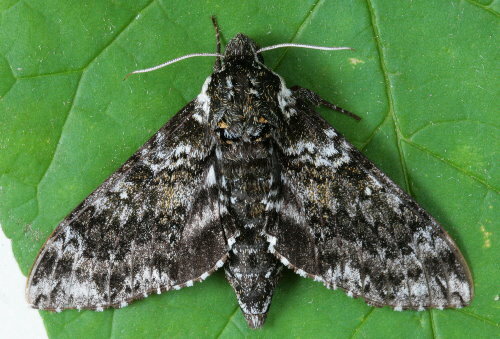 Just like birding with binoculars evolved from the hobby of collecting with a shotgun, so too has mothing with a digital camera evolved from collecting and pinning specimens. Many entomologists still maintain collections, and they do have important uses, but it’s becoming more and more popular simply to record what you’ve found or caught, and then let it go. The closest I’ve come to encountering a sphinx caterpillar in the wild is the mummified shells I found on the twigs of trees overhanging the lake during the winter. One website hypothesizes that sphinx caterpillars do most of their feeding at night, which would explain why they’re rarely encountered. Another factor is that sphinxes are never around in large numbers the way some things, like tent caterpillars, can be, although Lettered Sphinx can be found in small but moderate numbers in early spring, sometimes with as many as five or six individuals caught in a night. Most other species you’re likely to encounter probably every year, but you may only see one or two over the course of the whole season. 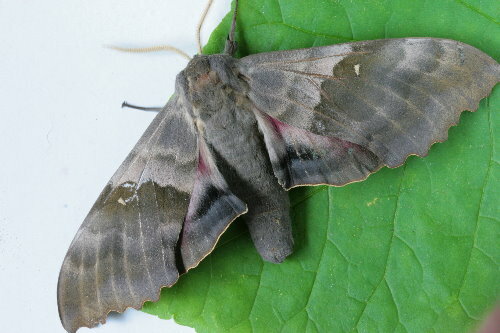 For example, the Laurel Sphinx above was a species I caught one of last year, and have only seen once this year so far. 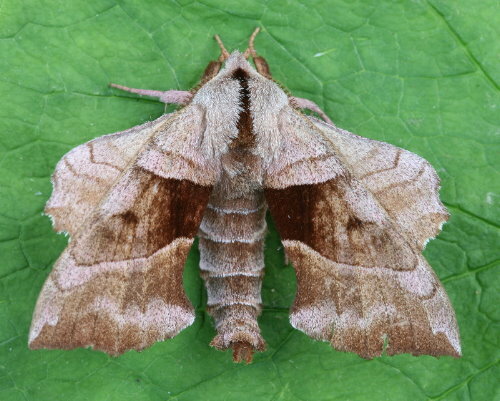 Some species have short flight windows, only a couple of months in the summer, but there are others that fly for several months, such as the Northern Apple Sphinx which is on the wing from May through September. The caterpillars of most sphinx moths actually burrow underground to pupate, though a select few might pupate in the loose leaf litter. Depending on their life cycle, some may spend the winter this way, while others may overwinter as eggs. I must admit that I get excited when a sphinx comes in to my light. They’re such striking moths – the charismatic megafauna of the moth world. I’ve illustrated 12 species here, but I expect I’ll still see a few more over the course of the summer. Great post, Seabrooke. Packed with beautiful images and intriguing bits of information. I know so little about moths and would be willing to guess, I’ll be paying more attention now. I should have entered my hawkwings in the moth carnival. 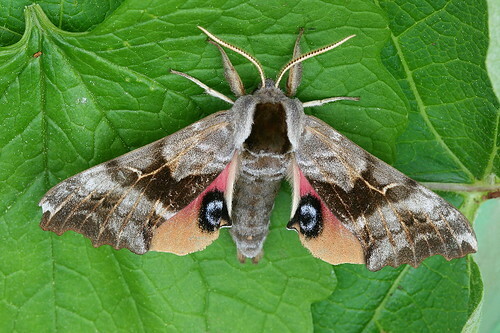 A great collection of sphinx moth photos — some of which I recognize and some I don’t. I love the moth photos. You missed my favorite one … the Pandora Sphinx Moth. Kentucky (with a big nod to Covell) is a moth epicenter. Thanks! 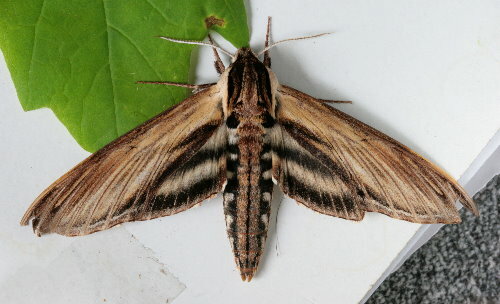 Your site helped me identify a Blinded Sphinx, Paonias excaecatus. Mind verifying?